Chalupa hits 1,000! - thanks, CPE! It’s been written many times, but I’d like to add my thanks to CPE for providing many opportunities to play with our dogs through the variety of competition classes and divisions. In my case, my Chihuahua, Chalupa (a.k.a. The Divine Miss C), was competing at Level 4 in the Regular division in all classes when her confidence took a nosedive for reasons unknown, although suspected. I tried many approaches to get her back to her confident little self, but the one that finally did the trick was to move her back to Level 1 in Enthusiast. We developed more as a team, the “Mexican standoffs” disappeared, she gradually increased from a permanent start line stay to a Sunday stroll to a reasonable trot and occasional gallop, and the 1,000-point title became a goal that kept me from moving her up too soon. Paraphrasing Sue F. of New Hampshire, it really does take a village to title a dog. Special thanks are due to the following handlers for their help and encouragement – Bob, Taylar, Carrie, Trisha, and especially Chris, who proved that a high, squeaky voice does make that little dog happy (alas, this is not one of my talents). Thanks for taking the pressure off of Chalupa and allowing me many opportunities to watch my little girl having a lot of fun. 2 of my students and one of my own dogs had a perfect weekend up in Greenwich NY at the CPE trial. Carol Thom was the judge. Perfect weekend is 8 runs, 8 Q;s. Yahoo! Quincy, "the Q-man", has a perfect weekend! We are so happy and proud of our 3 year old Boston Terrier, Quincy, who achieved a "Perfect Weekend" at the Stockade Agility CPE trial in Glenville, New York this past weekend. Quincy went 8 for 8 in his Level 2 Full House, Jumpers, Colors, Jackpot, Wildcard, Snooker and two Standard runs. A little perspective on this accomplishment: three years ago when Quincy came into our lives, we were first time dog owners who had absolutely no clue even how to train a dog to sit, let alone compete in the performance sport of agility. We were determined to succeed, and luckily, we found Trisha Stall and AgileDogs. We started taking lessons with Trisha (and her colleagues Lisa Norris, Bob Domfort, Chris Penna and Mariday Geyer) and we have come farther than we ever thought possible. Since then, Quincy has earned his CPE Level 1 Titles in Standard and Games (Handler, Strategy and Fun) and now the perfect weekend legs toward his Level 2 Titles. Trisha's positive training methods have produced great results for us in terms of qualifying scores, and that is exciting and rewarding. But even more than that, our association with AgileDogs has introduced us to a fantastic, supportive group of friends and teachers in the agility community who have made the sport even more fun than we thought it could be. Our thanks to Trisha and AgileDogs for helping us make our agility dreams come true!! Trooper Q'd 7 of 8 times. He dropped the last bar in Standard or it would be 8 for 8! He was wonderful. Thank you for suggesting to me to enter the CPE shows. Would you believe we have 11 Q's in 2 shows? I am aiming for the Nationals. This is so fantastic for Trooper, he was tired and very hot, but he worked with me and showed his heart. So if you don't try you don't know what you can do. 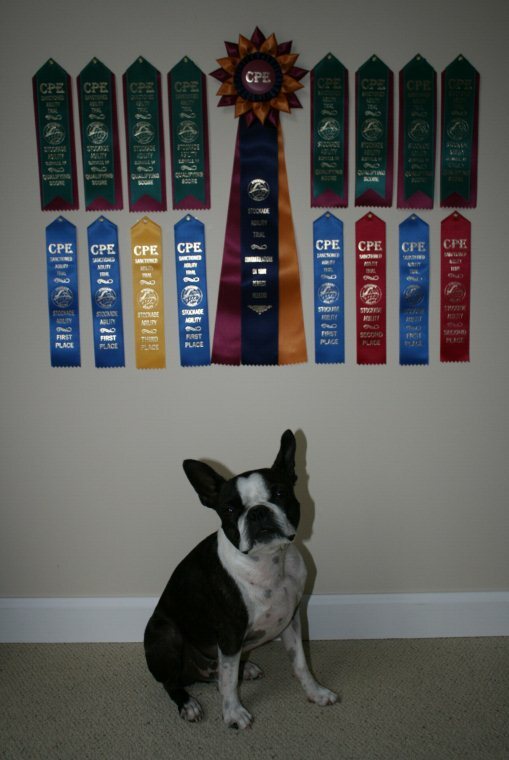 Liesl (finally) earned her last CPE level 2 title on 8/14/11 at the AgileDogs CPE trial. We're qualified for Nationals, yahoo! - in addition, she also earned the Level 5 Standard Championship title!! Congratulations to a very conscientious student! Jeff Boyer and Sizzle attain the CPE C-ATCh title! It happened Friday, October 29, 2010, at Muddy Paws in Westminster VT; and it was on Trisha's non-traditional jackpot - yay! Chris Penna and Otis break their non-Q streak in CPE after attending Trisha's "Breaking Out Of Your Shell" Seminar! "It was a good weekend for Otis because he broke his 7 month "nt because I can’t possibly run a course so I will be leaving the ring now" streak. Came close in Conway but this weekend he did it and I thought he had some speed at the end of that standard course. He ended up getting 2 Q's, in standard and colors. The standard run was the one I was most impressed with because I usually drop the leash next to him because if I toss it back it startles him and he has to investigate. I somehow dropped it on his tail and he took the first jump with it wrapped around his tail and he shook it off and kept going (and the bar stayed up).His colors run was also cool because I couldn’t remember if the tunnel was the blue course or green and he didn’t shut down on me when I slowed down."